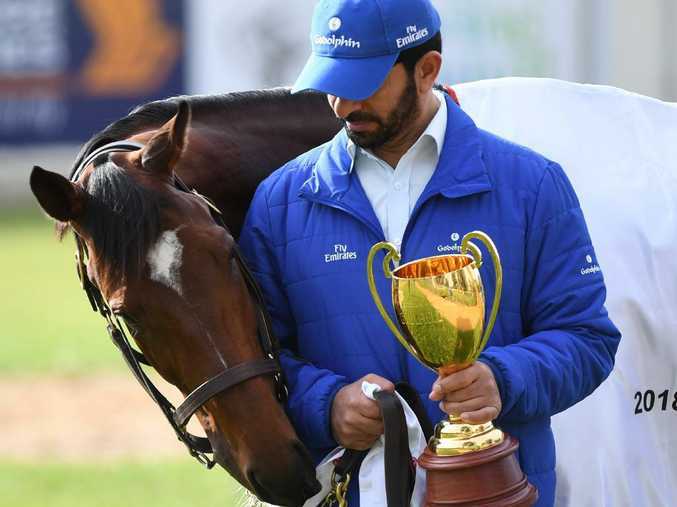 Godolphin trainer Saeed Bin Suroor with Best Solution and the Caulfield Cup trophy. BEST Solution already needs to set a weight-carrying record for a foreign raider to win the Melbourne Cup, and that's before Monday's announcement of a possible re-handicap after his Caulfield Cup win. 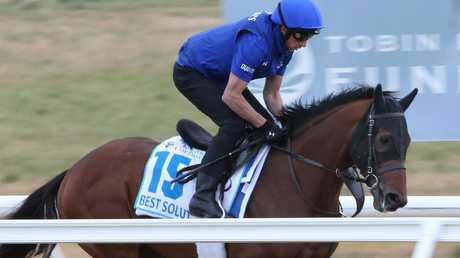 The Godolphin stayer has 57½kg for the $7.3 million Melbourne Cup (3200m) with talk Racing Victoria's chief handicapper Greg Carpenter will issue a Caulfield Cup penalty of about 1kg on Monday. But since the northern hemisphere-trained stayers began targeting the Melbourne Cup 25 years ago, none have won with more than the 56½kg Germany's Protectionist shouldered in 2014. In fact, since Think Big won his second Melbourne Cup in 1975 under 58½kg, no winner of the Flemington two-miler has carried more than 57kg, with the exception of the great Makybe Diva when she completed her historic Cup three-peat with 58kg in 2005. Best Solution produced a tough staying performance to win the Caulfield Cup, firming into $9 second Melbourne Cup favouritism behind Yucatan ($7). His winning margin was slender and the race time was slow but this was Best Solution's third successive Group 1 win leaving Carpenter with a dilemma whether to impose a Cup penalty. The Melbourne Cup now appears at the mercy of the internationals this spring with 10 of the top 12 in betting trained in the northern hemisphere. It is expected more than half the Cup field will be made up of overseas stayers. This prompts renewed debate about whether there is too many internationals in the Melbourne Cup. An owner, who preferred anonymity, said the Melbourne spring carnival has become a "benefit for overseas horses and a real slap in the face" for all owners who support Australian racing week in, week out. He argued there will be less incentive to breed staying horses in this country when there is an increasing number of overseas-trained stayers in Melbourne every spring. The late, great Bart Cummings often called for a cap on international runners in the Melbourne Cup although few supported his view at the time. But when it came to discussing racing issues, the "Cups King" was invariably right.